Can anyone help me with mitred corners? Thread: Can anyone help me with mitred corners? By the way, this is the first time I have ever posted a thread also. If I did it wrong or something isn't right I apologize. It wasn't intentional. As I have learned in the last 7 days, as I am new to this too, is that there is no right or wrong. No question is stupid (or so I'm told LOL) so not to worry about that. While I can't help you with your corners as I am working on them myself, I can tell you that there are a host of wonderful people who can and who will answer you very soon. Good luck! Oh and what you think is horrible may not really be. We are most critical of ourselves. I know I am. Did you trim your back and batting and top so they are all the same? There should be no batting showing. I am sure someone can help you. I am rather new also and someone here always has the answer. Good luck with the corners. I trim the batting a tiny bit and learned from you tube. I found watching it a few times helpful, as I did not get it all from one preview. I liked the Eleanor Burns You Tube tutorial the best. I have trimmed the batting a bit closer. However, since I hate mitering anyway, I make all of my quilts with rounded corners now and use bias binding. No mitering-I love it. And as a bonus, the bias binding goes on more nicely. If you do want to miter (sometimes I have to on non quilt projects) bias binding also miters a lot more easily IMO. 1- make sure backing n batting are cut even with front. 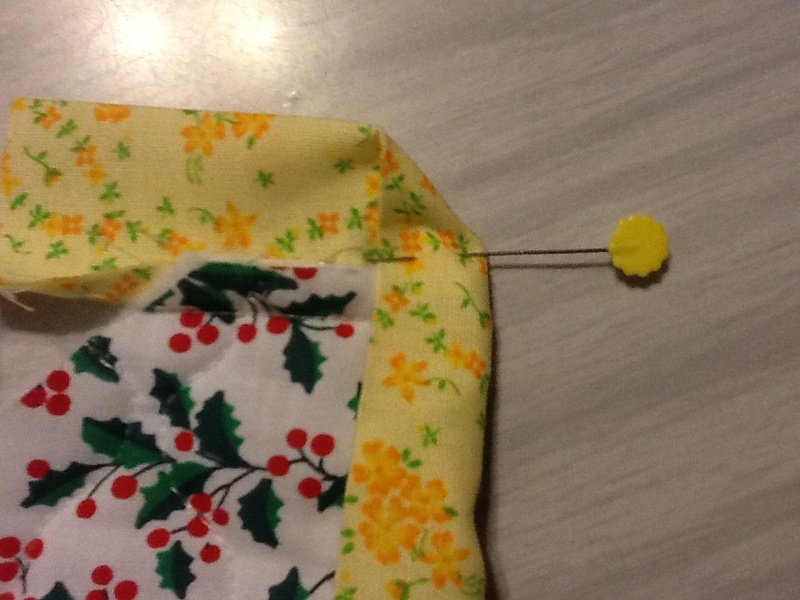 2- sew to 1\4 inch of end . Cut thread. Turn quilt. Fold binding straight up then fold down there is a step by step tutorial on you tube may seem bulky at first. cut corners after sewing. there is also a link on this site to a guy who sews to 1\4 inch of end but then turns and sews 45 degree to corner. he says gives you perfect corners. i just did lap quilt 2 corners the way I ususally do it and 2 his way to compare. havent sewn it to back yet though. good luck. pm me if you need more help! I use Hobbs 80/20 batt and I get a nice corner. They do have a little more bulk than the rest of the quilt. 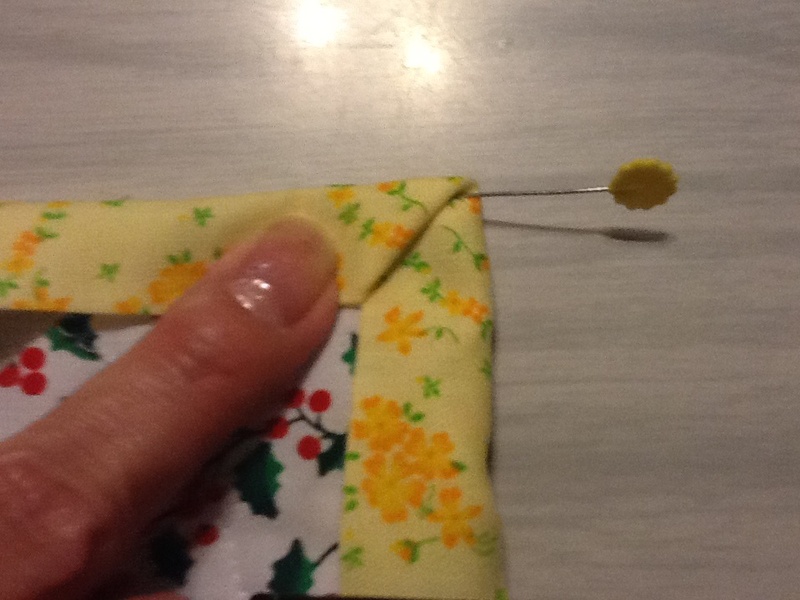 I use a pin to help with doing the fold in the back for hand sewing. I will see if I can post a picture but don't look at the weird fabrics as they are out of the scrap bin. Last edited by Tartan; 08-10-2013 at 07:46 PM. Here it is folded down for hand sewing the back. to get it right. So don't be too hard on yourself. What kind of batting did you use? over...there goes your mitre. Here's an excellent tutorial on binding. think I've improved over time. Thank you so much for your encouragement. I see you are from PA. I've only lived down here in TN for going on five years now. I was born and raised in PA, had my kids there, and now my kids and grandkids are there. If you don't mind my asking, what part are you from? I'm just so homesick and I miss my kids. I'm from York County. Thanks again. Yours looks so perfect. There's no way my big bulky mess would lay down that easily and nicely. I'll keep looking on Youtube. I'm so tempted to rip off all of the binding that I sewed and recut everything and maybe even cut off more of the batting so I have less between quilt top and backing. But then I think if there is a quick simple fix...which I doubt I will be that lucky....then I will have gone to all that trouble for nothing. Thank you so much for your help and your pics. You gave me encouragement that there really is a way to do it but I just have to find out how the right way is. I'm new to the board myself so first, welcome, you came to the right place, people are fantastic here. If you take a picture and upload it perhaps someone who is more knowledgable than I will be able to better advise you before you go ripping out your work. Look under QB Help and the instructions for uploading are there. Don't be discouraged!